Are you thinking about needing a new accounting system or ERP? If your firm is still on Deltek Advantage, Sema4, or FMS or even on Quickbooks, Protrax or another system, you might be evaluating options to figure out which solution is right for you. We receive questions from prospects asking about the differences between Deltek Vision and some other product. Additionally, during our conversations over the years, we have heard many myths about Deltek Vision and we thought it was time to set the record straight, as we see it. We use the product we sell. We know Deltek Vision inside and out. Can our competitors say that? Ask them. We aren’t just sales people. We care about the success of our clients and that’s not just rhetoric. We’d rather turn a sale away then have an unhappy client. We have done extensive migrations of all kinds of software. What we have found is many of our competitor’s software are done on the cheap or just completely leave out industry standard capabilities. Myth #1 - Deltek Vision is only for large firms. Fact #1 – The numbers don’t support this claim. As a Deltek Premier Partner, the majority of the firms we serve are under 50 employees. Of those firms on Deltek Vision, 57% are under 50 employees; 33% are 25 employees or under; and 17% are 15 employees and under. Most importantly, the size of your firm should have no bearing on the solution you choose. What is more important is choosing a solution that fits your staff’s needs, the information you need to make business decisions and your firm’s growth plans. Deltek Vision fits firms of any size. Additionally, in 2012, Deltek came out with a cloud option (SaaS) for Deltek Vision that made Vision simpler to deploy at a lower entry price for any size firm. Check out this 10-person firm’s story. 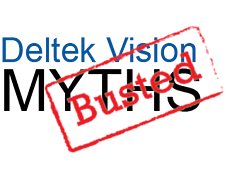 Myth #2 – Deltek Vision is so expensive. Does the quote include migration? Our experts have been doing migrations for almost 30 years and we are proud to say we probably have some of the best in the business. When it comes to migrating your data, we highly recommend importing your historical data. The level of import can vary, but it’s important to make sure you are comparing apples to apples. Will bringing over the beginning balances be enough? This is only a question you can answer, but our experience has been firms rarely want this option unless that is their only option. Do you really want to lose all of your historical information? This is more than a transaction. You are not just buying software, you are buying a solution that needs to address the specific capabilities your firm’s needs. More importantly, you are buying into a relationship. From our perspective, we aim to make sure the software is the right fit. If it isn’t Deltek Vision, then we will raise our hand and tell you. That is why we take a consultative sales approach and conduct a discovery to uncover what is working well and identify if there are bottlenecks or inefficiencies that could help you improve your business. The discovery process should identify the output needed. More specifically, what data (reports, alerts, dashboards, etc.) is needed to make business decisions? These specific capabilities should drive what you are looking for. Make sure you are talking to a consultant during the process, not just a sales person and take time to establish a relationship. We are here to help you today and tomorrow as your firm grows. Myth #3 - Vision is complicated. Firm Evolution - Should your firm have different contract work types; need to expand your business; or face evolutionary life cycle challenges, like ownership transition and retirement scenarios, Deltek Vision can easily accommodate growing firms. It has all the utilities, under the hood to handle these contingencies. Acquisitions – Should you acquire a new firm, all of the data can be accommodated in Deltek Vision. The same cannot be said about our AE ERP competitors. In fact, in addition to a push button conversion for Advantage users, Full Sail Partners has created push button conversion tool for Ajera. Additionally, we have a very streamlined process and economical migration price for Quickbooks. The same cannot be said of our AE ERP competitors. Because Deltek Vision has the ability to create custom fields, tabs, grids, and User Defined Info Centers (UDIC), all data can be represented. To put it simply, Deltek Vision can represent all data from other databases. However, if a firm was on Deltek Vision and tried to migrate to our competitor’s software, you would in fact lose data. Myth #4 – Other AE ERP Solutions have the same capabilities as Deltek Vision. Audit Trail - Deltek Vision has an audit trail. When changes are made in Deltek Vision, all changes are tracked and you know who made the change and when. This is not only important from an accounting perspective, but very important for firms that have government compliance requirements. Multi-Company - If this capability is needed, Deltek Vision allows the set-up of multiple companies including reporting with a single sign-in. One financial report can be run to see how each company is doing. Other solutions have tried to resolve this issue on the cheap by creating separate database instances requiring multiple logins. Keep in mind, you will not be able to share financial reporting for all companies and there is no automated Inter-company billing process, therefore, each company reporting is separate. CRM - If this capability is needed, Deltek Vision has an integrated, seamless CRM and proposal automation module that has a single sign-in. Additionally, Deltek Vision integrates into other marketing tools, including Constant Contact, MailChimp and Hubspot. Other AE ERP solutions may integrate with other CRM solutions. Because of that you will have a separate system that requires two separate logins. The process is far from seamless and none of them integrate with other marketing tools. Security – Deltek Vision provides the ability to lock down any field in the system and make it read only. Unfortunately, security in other AE ERP solutions are not as robust as Deltek Vision. Custom Fields – Deltek Vision provides the ability to create user defined fields, tabs, grids and info centers as your firm sees fit. As your firm grows, you may need to track further information. Workflows – Deltek Vision provides the ability to streamline processes through workflows. For example, sometimes data needs to be represented in two locations. However, you never want to a have dual entry process. In Vision, you can have data entered into one location and the data flows to the other location. View this webinar, to learn more about the power of workflows. Utilities – Vision has built-in utilities to handle contingencies to easily clean-up and move data without a migration or custom expert. Need to move billed time to a new phase? There’s a button for that. Need to combine two clients together? There’s a simple to use conversion tool to do that in seconds. Need to move data from one location to another? There’s search and replace utility that is simple to use. Have more than 999 projects and need to add another digit to your project number structure? There’s key formats for that. Finding the right ERP solution for your business is not an easy process and is full of misguided information. Therefore, asking the right questions is imperative to get clear answers. Formulate your questions based on the needs of your firm. Then find out and compare how each ERP solution manages these requirements. Make sure there is substance. Those shiny features might just be an illusion to distract you from the lack of robust capabilities. Some AE ERP solutions try to act like Vision, but they don’t perform like Deltek Vision.